The following is a smattering of information I gathered, when looking up information for someone I love, who had their gall bladder removed after a few attacks, and at the last hospital visit, found out they had the start of Type 2 diabetes. Encouraging them to go keto or Paleo for their diabetes, I knew I had to find information about that, without a gallbladder. Some of the following shocked me, because of the links between different health issues. But it shouldn’t shock me. This is for my future referral and you, the reader to take and use as you will. I am not an allopathic doctor and make no claim or hold any belief that I am your health authority – you are responsible for your own health and choices. It also mentions a drug that QUICKLY dissolves gallstones (not my preference and I know it’s too late for you, but info to tuck away to share with others? ), so that someone could get rid of the stones and then immediately go Paleo with high veggies and work on gut health and keep their gallbladder. Since I am really convinced about getting nutrients through foods as much as possible, that offer a range of variety within each food individually rather than lab-made isolated nutrients without any protective co-nutrients, this led me to find a list for you about enzymes from foods, to help you digest fats and foods better! Uhmm…. diabetes, hypothyroid, gallbladder problems…. sounds familiar! Because of all the issues connecting together and that they would all be healed or avoided by eating low-processed carbs and higher fat, I would think that Paleo or Keto and the Yasko nutrigenomic protocol would be highly valuable for a person struggling with these things. And, tagging along with the nutrigenomic stuff, my friend just sent me this link a few days ago. Eat the liver! 9 times out of 10, when you have mounting problem with someone who is good-willed, you haven’t brought it to them before, and you are not able to move past it (which is not negative), the best course of action is to go directly to them in love and talk about it with them. Privately. Ghosting them is childish and absolutely confusing to the person in this situation (which is a vastly different situation than “ghosting” an evil-willed/abusive person) and calling them out in a public way if you’ve *never* addressed the issue with them (to give them any chance of changing or sharing with you) before is typically just cruel and bullying. It’s foundation is one of disorientation and humiliation. We can all be so much better than this with one another. I am working on this aspect in myself, specifically the ghosting. Ghosting has become my default in trauma survival, the complete opposite of the doormat I allowed myself to be for nearly 3 decades. But what helped me survive coming out of that abuse, no longer works as I am trying to thrive. None of us are perfect. It is to our own personal detriment to demand it of others when we cannot possibly be, ourselves. All we can do is try to better ourselves and encourage our loved ones to, as well. “It matters that they learn that worship is what we do as a community of faith, that everyone is welcome, that their worship matters. When we teach children that their worship matters, we teach them that they are enough right here and right now as members of the church community. They don’t need to wait until they can believe, pray or worship a certain way to be welcome here, and I know adults who are still looking to be shown that. It matters that children learn that they are an integral part of this church, that their prayers, their songs, and even their badly (or perfectly timed depending on who you ask) cries and whines are a joyful noise because it means they are present. This momma says this so much more eloquently than I ever have, but this is why I stopped sending Melody off to “Sunday school” after she was 4 or so. 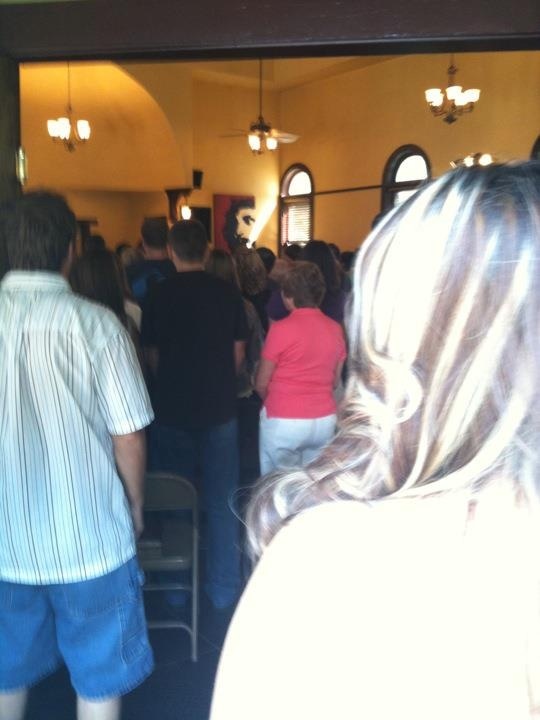 It’s why I don’t remove myself/my children from the service when they whimper. Not only am I a part of the Body, but I want my children growing up knowing that they can be as well. They don’t need to be sent away to learn about Christ and how to live like Him, they can learn with all of us. They can ask us questions. They can make a joyful noise in front of all of us. Or a sad one. what matters is what I am choosing to invest in for my children. Sending them away from me to learn about God, the Body, and loving others… wasn’t at all a priority for me (or sound rational, when wanting to let my children know that they can be a part of the fellowship of Christ). So, anyway. I just really loved that older post and and I wanted to share it with you. When you start working/healing through PTSD, trusting the “red flags” is scary. It’s an element of trusting yourself and you really feel like a failure and should not trust yourself. 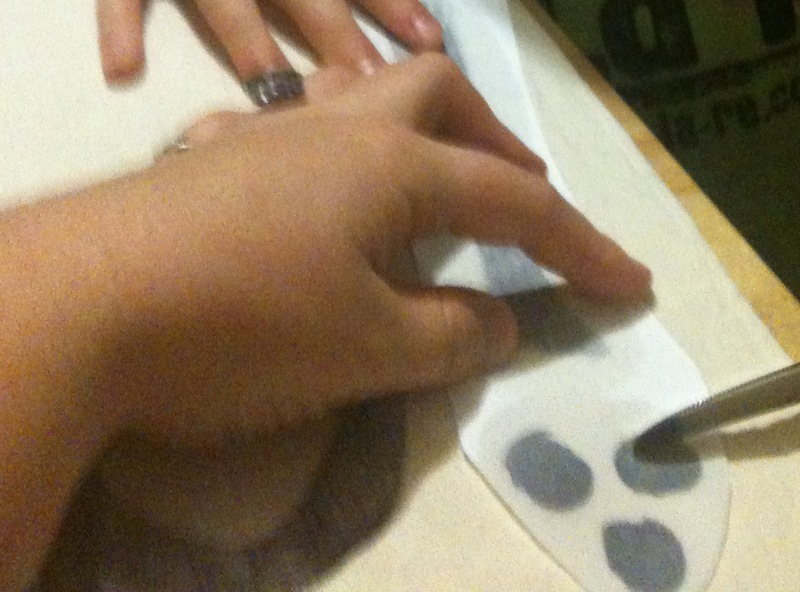 Overall though, it’s a relatively easy part of the healing process, because it adds a layer of protection. For those struggling with PTSD, protection is the ultimate goal. To finally feel safe again, whatever it takes to feel that way, even if the method itself is unhealthy and not really keeping you safe. PTSD is fun like that. At any rate, trusting the red flags around specific people IS a good practice, for everyone, but specifically for people who have gone through a traumatic event that included some sort of abuse. But, what I have found is REALLY difficult is trusting something else inside of you. The ability to discern mostly who is decent, who will generally not seek to harm you, but will like yourself, inevitably disappoint others. Disappointment and hurts in a typically healthy relationship is “normal.” Someone seeking to harm or destroy you is a whole different ballgame. And it is kind of terrifying trusting your ability to discern who is safe. It’s not like trusting the red flags, which put bricks in your wall of defense. It’s actively not only not putting bricks up in a wall that needs to be there for someone with signs of an abuser, it’s actively taking bricks out of sections of the wall, to let someone considered to be safe, in, entrusting that they will be an active member of your life that is also willing to invest healthfully in your life and sort of… take the place of those bricks. That when those that DO seek to harm you have come (and they will), they will be there to invest love and support. And protection. It is scary to trust yourself with that specific ability. Will I fail at this aspect – again – what will it cost me, my family, my children, if I have? I have wanted to make celebrating birthday’s and holidays as eco-friendly as possible. Usually this does not require any extra money. It simply means not buying disposable products, which saves money. It means making foods and beverages from scratch, which again, saves money. Not buying a lot of trinkets and toys that won’t get used – saving money. Rather than buying crepe paper year after year, why not use some scraps of fabric and ribbon and make a bunting banner? You can create any shapes you want: Rounded, triangle, square. You don’t even need to make shapes! Maybe you use cotton, maybe you use wool felt! You don’t have to use fabric, either. You can use paper as well (and by the way, THIS is my favorite version I have seen of these!). Or make mini chalkboards. Or let your imagination run wild and do something else! 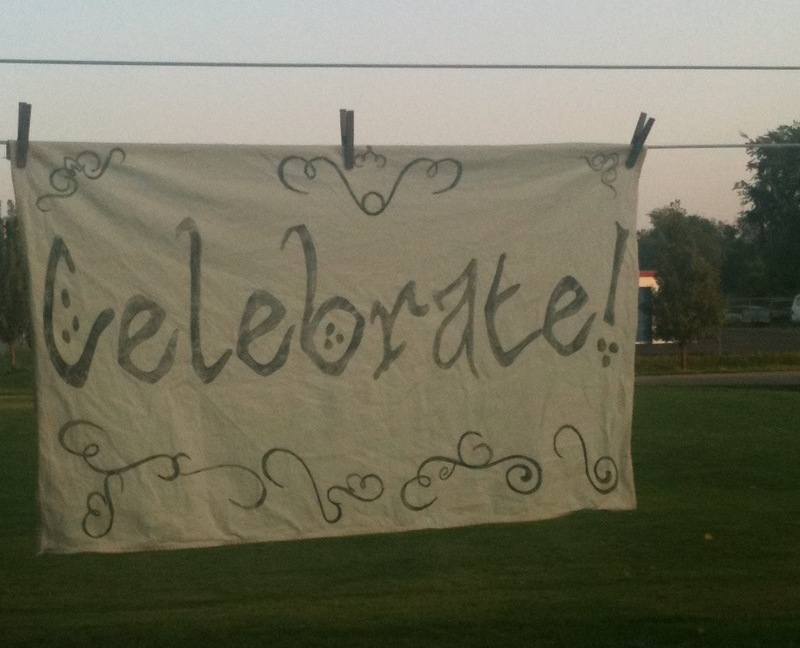 Instead of buying a plastic sign that declares excitement for the birthday or holiday, you can make a banner from fabric, which will last much longer than the flimsy plastic signs. That’s where this post comes in! This is an image-transfer banner. I’ve created a banner on the cheap that will last for years to come. 🙂 Here’s a quick, easy tutorial. I hope the pictures are clear enough for you. Start with the piece of fabric. Wash, dry, iron. Cut to desired size, with a bit of extra for seam-allowance. I measured and cut mine to 40″x 25″. 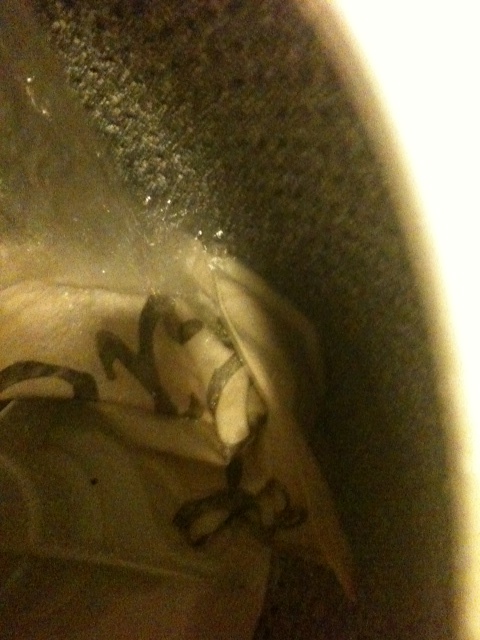 On one side of fabric, roll 1/4″ and iron-press. Roll over the same side, another 1/4″ and iron-press. Sew in place. Repeat on remaining three sides. Print desired words, pictures, etc. onto paper with laserjet printer. Make sure that any words or pictures that you want to show in its correct orientation on the banner are printed backwards. For my project, I used free flourishes from FontSpace and free Hobbiton fontwork from the same place. Once printed, cut out the letters and pictures, leaving about 1/2″ of ink-free paper around the print. 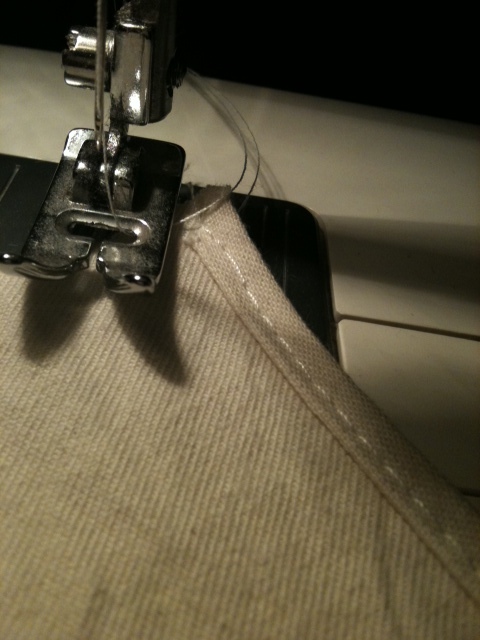 Place sewn fabric on a table. 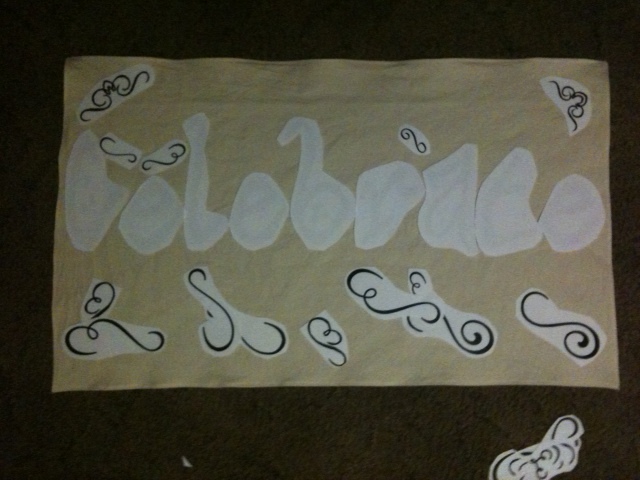 Arrange the cut papers on the fabric banner (ink-side down), to get an idea of the proper layout. It may be helpful for you to take a picture of it, so you can remember the placement. As soon as you’ve spread the essential oil on the paper, hold onto the edges of the paper with one hand and apply gentle but very firm pressure with the smooth edge of the butter knife in your other hand. Or, have another person hold the paper while you use the butter knife. Repeat for each piece of printed paper. When you have finished, wash the banner and dry it. You could add eyelet to the corners, to hang up for display later, or you could use ribbon and clothespins. Either way would work. Here’s my banner hanging up to dry! Perfect for Christmas, birthdays, and more. How important is it for modern Christians to understand the Biblical Hebrew calendar? I’m not sure. I just know that as I learn more about the Biblical months, the more in awe I am, the more intricate I see God’s plans, the more miraculous I see the every day, and the more I feel a sense that it is important for us to know… His signs. The Biblical Hebrew calender is based off of the lunar cycle, acknowledging all the governing lights, including stars! Genesis 1:14 tells us that the lights of the heavens were given to us not only to mark the passing of time, but also to mark celebrations for His people AND as signs. Nisan is the first month of the Biblical year. It begins on the Gregorian calendar (devoid of marking God’s signs) on March 17 – happy new year! Nisan is connected to the tribe of Judah – the fourth-born son of Leah and Jacob. After three other sons that Leah desperately thought would draw her husband to finally love her, she had Judah and she said, “now I will praise the Lord.” It was as though she knew her husband would never choose to love her and she chose to praise God anyway. She bestowed that strength on her son, Judah, as well. Nisan is the month of Passover. Many of us do know that it is a celebration in the Hebraic faith of the Holy Spirit passing over the homes of Jewish families who had sacrificed a lamb and marked their doorframes with it’s blood, when the Plague of Death of the Firstborns went throughout Egypt – sparing their families. It is a celebration of their liberation from Egyptian slavery. Here we have, culminating in the first month of the Biblical new year… the lion and the lamb. I am sure there are quite a few Followers of Christ that know this, but I am quite new to learning about Biblical Hebrew months and this connection of the lion and the lamb made me tear up! And that is just one aspect of only Nisan.